Product #60578 | SKU DC-G91/95 | 0.0 (no ratings yet) Thanks for your rating! The new Panasonic Lumix DC-G91/95 Camera with 14-140mm f/3.5-5.6 II Lens sports an integrated OLED LVF with a 2.36m-dot resolution alongside a 3-inch OLED 1.24m-dot resolution articulated screen. Overall, it’s a small and compact camera body at just 13 x 9.4 x 7.7 cm, weighing merely 536g. It’s also worth noting that the all-new G91 is the first camera in the G line that features V-Log L. Unfortunately, internal recording to the single SD card is limited to 4:2:0 8bit. Nevertheless, you can use the Micro HDMI port to output a 4:2:2 8bit signal to an external recorder. Another welcome feature is the inclusion of a 3.5mm mic input along with a 3.5mm headphone jack, a remote port, and a USB-C port that can be used to power/charge the unit. The LUMIX G91 includes 5-axis Dual I.S. 2 stabilization, which combines the Optical Image Stabilizer with the Body Image Stabiliser. The 5-axis Dual I.S 2 stabilization works in photo and video mode, and should compensate for movement while shooting up to an equivalent of 5-stops shutter speed. 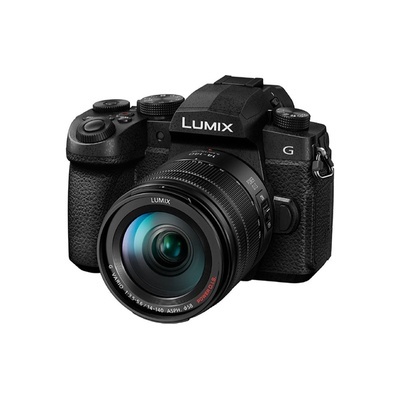 Also, the G91 features LUMIX’s 4K photo modes which give you the ability to extract a picture from a 4K video. A new Auto Marking function automatically detects frames with changes to the image. On top, the camera is equipped with Bluetooth 4.2 and Wi-Fi 2.4GHz, so you can control its settings wirelessly via an app, or use it to share your photos without the need for a computer. Finally, a dust-/splash-proof battery grip (DMW-BGG1) is also available if you need to increase battery life and grip. Along with the new LUMIX G91, Panasonic introduced the next iteration of the popular LUMIX G VARIO 14-140mm F3.5-5.6 II ASPH. It is a lightweight, compact F/3.5-5.6 telephoto zoom lens with Power O.I.S. image stabilization. This new version features a splash-/dust-resistant construction and consists of 14 elements in 12 groups, with three aspherical lenses and two ED (Extra-low Dispersion) lenses. The lenses are multi-coated to minimize ghosts and flare, whereas the lens aperture has seven blades. The new LUMIX G VARIO 14-140mm / F3.5-5.6 II ASPH is also capable of smooth, silent operation to work with the camera’s high-speed, high-precision contrast AF system for both photo and video recording. It is also compatible with the sensor drive at max.240 fps to take maximum advantage of cameras with high-speed AF.